May 2013 marked the 60th anniversary of the first cast performance of Under Milk Wood, which took place at the 92nd Street Y Poetry Center in New York, with Dylan reading the parts of first voice and the Reverend Eli Jenkins. Swansea’s Dylan Thomas Centre celebrated the anniversary by staging “Milk Wood Days” events which included an Under Milk Wood themed young writers workshop, and “Milk Waking Wood”, a new entertainment presented by Fluellen Theatre, that looked at some of the residents of Llareggub and how they, and the play, have influenced other writers. The Centre also staged another Under Milk Wood twitter exchange which saw characters from Dylan’s play exchanging dialogue across the popular social media platform. 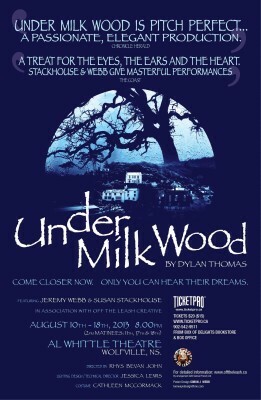 Another exchange on Twitter also led to some interesting information about another Under Milk Wood anniversary being published online. A twitter conversation between a Dylan Thomas fan and our twitter feed @dylanthomasnews alerted the Fogg Museum at Harvard University that 3rd May 2013 was the 60th anniversary of a solo reading of the as then unfinished Under Milk Wood by Dylan at the Fogg Museum. This led to the Harvard Art Museums publishing a very interesting piece on their blog and they also tracked down a copy of the original Boston Herald review. 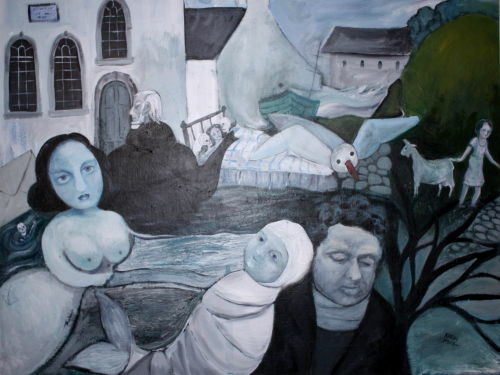 We celebrated the anniversary by looking at 20 milestones to Under Milk Wood on our blog. Three important Dylan Thomas manuscripts were sold at auction at Bonhams, London, on May 8th. A manuscript copy of “For As Long As Forever Is” fetched the highest price when it made £23,750. A copy of “In The White Giant’s Thigh” fetched £10,000, and a copy of “This Side Of The Truth” fetched £13,750. The buyers identities have not been made public. A Dylan Thomas inspired creative writing competition “The Colour of Saying” was officially launched at the National Waterfront Museum, Swansea, on May 19th. Attended by Dylan’s granddaughter Hannah Ellis, the event included a performance of a new short drama “The Poet, The Hunchback & The Boy” by Peter Thabit Jones, performed by Swansea Little Theatre. Welsh poet and Archdruid, Jim Parc Nest, read from his Welsh translation of Under Milk Wood, with Laugharne based actor Mark Montinaro reading from the original version. The website Literary Traveller published an interesting interview with Hannah Ellis who talks about what it’s like to be the granddaughter of Dylan Thomas, and her hopes for his legacy and the 2014 centenary. The prestigious literary prize for young writers has announced that Swansea University will be it’s new major sponsor. Entries are currently being invited for the 2013 award with a closing date of 28th June. Chairman of the Dylan Thomas Prize, Peter Stead, said “This prize has a terrific record of uncovering and fostering new talent – whilst being a true grassroots literary award”. May also saw the announcement of “Developing Dylan“, a new education project from Literature Wales that plans to put Dylan’s work at the centre of a series of initiatives aimed at inspiring the young people of Wales. The project, which was launched at the Urdd Eisteddfod, has been funded by the Welsh Government, and will feature a series of workshops, an international competition, a roadshow, and will be supported by a Developing Dylan website. The project will run from October 2013 to October 2014, with the website launching in July 2013. 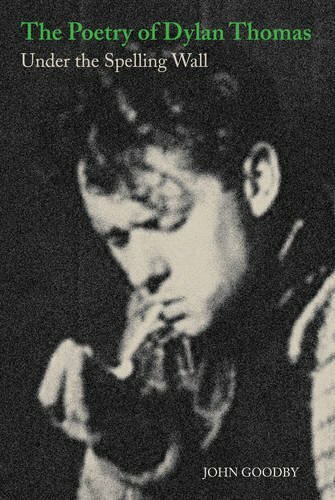 A major new critical study of the poetry of Dylan Thomas is due to be published on May 31st. “The Poetry of Dylan Thomas : Under The Spelling Wall” by Professor John Goodby of Swansea University, published by Liverpool University Press, will be launched at Waterstones, Swansea on June 5th. Swansea West MP Geraint Davies is planning a reception at the House of Parliament to honour Dylan Thomas. Culture Secretary Maria Miller is expected to attend, as well as Shadow Secretary Harriet Harman, and ambassadors from around the world. The major refurbishment of Cwmdonkin Park is nearing completion. The tearooms are now open again, and regular events are planned by the Friends of Cwmdonkin Park. This year’s Gower Walking Festival includes two Dylan Thomas themed walks. Return Journey, on 9th June, will be led by the Lighthouse Theatre’s Adrian Metcalfe, and will re-create Dylan’s walk through the post-Blitz Swansea that inspired his famous radio broadcast. On 14th June an exploration of Dylan’s home suburb of Uplands will include a visit to his birthplace in Cwmdonkin Drive. One of this year’s series of literary tourism events arranged by Literature Wales is an innovative canoe trip across the Taf estuary from Laugharne in the company of Dylan experts Dr John Goodby and Jeff Towns. This will be followed by an evening of Dylan Thomas, jazz, and New York food. The event takes place on 20th July, the brochure can be downloaded here. The annual Dylan Thomas Festival takes place in Swansea from 27th October to November 9th. This year’s festival will include the launch of a new Dylan Thomas centenary commission by Gillian Clarke, a preview of Fluellen Theatre‘s production of Dylan’s “Rebecca’s Daughters”, and an evening of reading from Dylan’s work in his old local, The Uplands Tavern. Further screening of Andrew Sinclair’s 1972 big screen version of Under Milk Wood. The director will attend the screening. A number of productions of Dylan Thomas’s classic play for voices are planned. Wheatsheaf, Fitzrovia, London 8th-9th November – A production on the 60th anniversary of Dylan’s death at the public house where he met Caitlin in 1936. The festival based in Dylan Thomas’s home suburb of Uplands, Swansea, that launched in 2012, returns in 2013, 1st-3rd November.